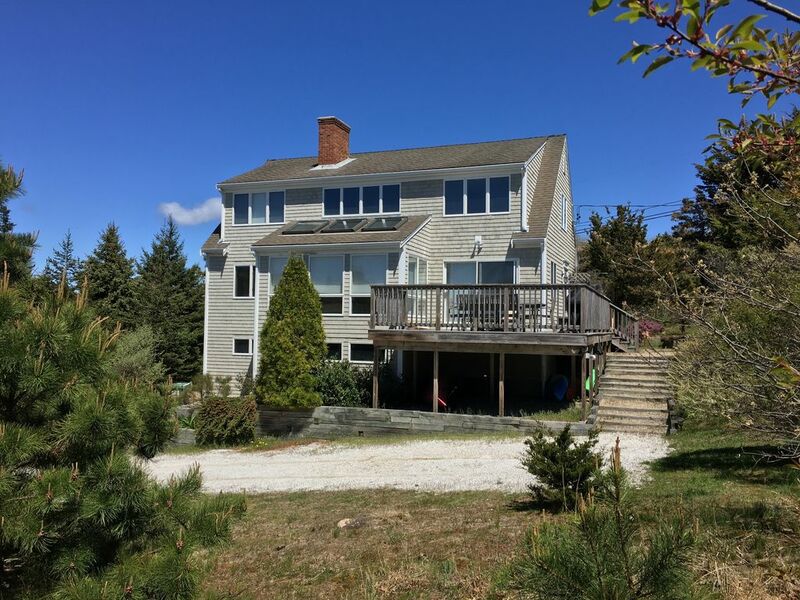 Overlooking Cape Cod Bay and acres of Conservation Land, this sunlit airy vacation house is just a few steps (only 1/10 mile!) from Great Hollow Beach. Loads of natural light! House faces west: enjoy spectacular sunsets over Cape Cod Bay! This spacious contemporary has 4 bedrooms and 2 full baths. Its fully-equipped kitchen, and open-plan living room and dining area are perfect for entertaining family and friends. Play the baby grand piano in the beautiful sun-room! Watch TV in the comfortable second-floor loft den. Dining area has sliding glass doors opening to a deck equipped with a Weber gas grill and lovely teak furniture. Soak up the morning sun with your breakfast on the east-facing patio. Walk to lovely Great Hollow Beach or stroll leisurely to Corn Hill beach and Pamet Harbor on the old railroad path! There is also a laundry area with washer/dryer, a pool table and ping pong table in the basement, and an outdoor shower. Pet friendly! There is a full bath on each of the 2 floors, a 1/2 bath in the basement, and an outdoor shower. Who can complain about being this close to great hollow beach?? Great getaway...perfect sunsets....perfect beach for young children and also close to the National Seashore...perfect place for walks, talks and to rejuvenate! Clean, neat and well equipped kitchen. We thoroughly enjoyed our stay! Total of 8 (2 families) fit comfortably. The proximity to the beach was fabulous. Sunsets unbelievable! Thank you for being great guests! Hope to see you again next summer! The house was a stone's throw from the beach and had enough room so that the six of us didn't feel cramped. Pet-friendliness was a huge plus as my dog sitter bailed at the last minute. Beautiful views from the second floor and lots of cross ventilation. There's a trail a short distance away and the Cape Cod rail trail is about a 10 minute drive. I'm an avid cyclist so this was a big plus for me. Huge deck with a nice grill. Would definitely consider staying again! Wonderful home for a family vacation including Fido! The bay side beach was perfect for kayaking, paddle boarding, walking and even having an evening campfire. Great café at the end of the road to walk/bike to and spectacular sunsets. We enjoyed the proximity to P-town for shopping and dining out as well! We had a fantastic week in Truro. The photos listed are somewhat limited and we weren't sure what to expect. The house is very bright and spacious. We were pleasantly surprised by the loft-like space upstairs in addition to the bedrooms. The location is PERFECT! It is very close to the beach, yet private. We will absolutely be back. Other Activities: great walk on old railroad path, to Corn Hill Beach and Pamet River and marsh. Pets allowed, with a pet fee of $50 per pet per day. Rates negotiable for longer stays. Thanksgiving and Christmas weeks at peak rates.